Forest conservation and climate action groups across Australia today condemned the Gillard Government's failure to end years of forest destruction by leaving Regional Forest Agreements in place and exempt from Federal Environmental protection laws. "The Gillard Government's changes to national environment legislation ignore the most critical conservation issue in Australia - that intensive industrial logging and woodchipping of native forests has unacceptable impacts on wildlife and climate change", said Peter Campbell, spokesperson for the Australian Forests and Conservation Alliance (AFCA). “The Gillard Government is determined to continue with the fiction that various Regional Forest Agreements, which overrule both the EPBC Act and corresponding State laws to enable resource security legislation for the logging industry, provide credible environmental protection for forests. It is quite clear that RFAs have failed to do this." said Peter Campbell. "There is overwhelming evidence that RFA’s are failing to protect wildlife, water resources or account for climate change impacts of the industrial logging and associated burning.” said Prue Acton, from the South East Region Conservation Alliance. “The Government has refused yet again to bring forests back under the protection of the EPBC Act despite widespread breaches across the country of so-called environmental protections for forests." said Noel Plumb, from Chipbusters. Mike Kelly MP, the Parliamentary Secretary for Agriculture, Fisheries and Forestry, recently told the national Forest and Climate Forum in Canberra that the Government intended to review the RFA’s next year, prior to their renewal. “This ‘head in the sand’ position is not acceptable as the world spirals towards a biodiversity loss and climate change disasters. The RFA’s must be consigned to the rubbish bin of history.” said Noel Plumb. “We need a new approach right now to rapidly move the logging industry out of native forests and into existing plantations that now dominate the market. This approach could more than double Australia’s present efforts to reduce greenhouse emissions and protect biodiversity.” said Peter Campbell. The Victorian Supreme Court has ordered the state-owned timber company, VicForests, to temporarily stop logging in the Sylvia Creek Forest, north-east of Melbourne. Environmentalists were seeking an injunction to stop what they describe as accelerated logging in the forest. They say the area is an important habitat for the threatened Leadbeater's possum. The court granted an injunction until 4:15pm (AEST). My Environment spokeswoman, Sarah Rees, says she hopes the court will extend the injunction. "Through the tears, I think this is the first step towards a hopeful future for the Leadbeater's possum," she said. "We're confident the judge is receptive to the concerns the community share about the Leadbeaters possum and its future, which at the moment is in question." Ms Rees says she has spoken to Toolangi locals, who are relieved. She says around 20 protesters are at the forest today. "Naturally, you can imagine that for the moment they're quite jubilant that they're going to see that the trees are no longer coming down," she said. Lawyers acting for My Environment told the court, logging activity had escalated in the past few days. They told the court, 20 per cent of the Gun Barrel coupe had been felled within the past two days. The judge ordered VicForests to stop felling trees in the area until this afternoon, but said they could continue to remove any trees that had already been chopped down. In a statement, VicForests says it will comply with the court order. It says it has assessed the area, in conjunction with the Department of Sustainability and Environment and found it is not an accepted habitat for the possum. AN ENVIRONMENT group has won a temporary injunction to stop logging in a Victorian forest that may contain endangered possums. MyEnvironment applied to the Victorian Supreme Court today for an urgent injunction to stop VicForests logging trees in the Sylvia Creek Forest near Toolangi, northeast of Melbourne. 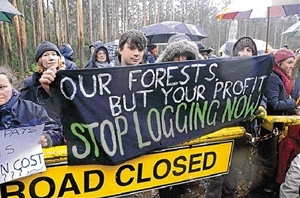 Justice Robert Osborn granted a temporary injunction stopping logging until 4.15pm (AEST) today. Lawyers for VicForests are expected to make further submissions when the matter returns to court at 2.15pm (AEST) today. Environment groups are seeking a Supreme Court injunction against the logging of bushland near Sylvia Creek, near Toolangi. The State Government-owned timber company, VicForests, has begun logging parts of the forest. Opponents claim the area is home to the endangered Leadbeater's possum and must be protected. Conservation lawyer Vanessa Blyer says her client's case is clear. "The writ alleges that Leadbeaters possum habitat is being logged right now," she said. "As a result, the logging is unlawful. "And as a result, the court is asked to permanently restrain VicForests from logging near Leadbeaters possum habitat." AUSTRALIA'S best-known brand of paper, Reflex, is to be stripped of its international green certification after its maker, Australian Paper, watered down its commitment to the Forest Stewardship Council system. Australian Paper's decision means it will continue to use wood sourced from native forest to make Reflex - welcome news for Victorian state government-owned logger VicForests, which counts the company among its largest customers. While auditor SmartWood, a division of the Rainforest Alliance, said Australian Paper now has six months to remove the FSC logo from Reflex packaging, a company spokesman said it had not used the logo for about six months. SmartWood said existing plantation and recycled paper FSC certifications held by Australian Paper were not affected. The company's certification under the rival Australian Forestry Standard was also unaffected. Australian Paper's decision follows a long-running stoush between the company and conservation groups over the interpretation of an FSC clause forbidding the use of wood from ''high conservation value'' forests. Australian Paper chief executive Jim Henneberry said the company had decided to withdraw its ''controlled wood'' from its FSC certification because of ''uncertainty'' over interpretation of the standard. Company spokesman Shaun Scallan denied the move was a backflip from a written commitment given by Mr Henneberry in May last year, in which he promised Australian Paper would not obtain ''wood harvested in forests where high conservation values are threatened by management activities''. ''We're hopeful that we'll get a definitive position on the issue that caused us to withdraw from the controlled wood standard,'' Mr Scallan said. Sarah Rees, a director of Healesville-based green group MyEnvironment, said Australian Paper had ''dumped their green tick in order to continue to buy wood from VicForests''. I, along with around 100 local residents, visited the Sylvia creek forest near Toolangi in Victoria that is currently being logged by VicForests. I was schocked and disgusted by the destruction I saw wrought on this wonderful forest. Not a single tree was left standing, and many portions of logs were lying around apparently discarded. It was a scene of utter devastation. This forest survived the 2009 Black Saturday bushfires and provides homes for Leadbeaters Possum and other endangered species. Yet it is being devastated by VicForests, in contravention with the law that is supposed to protect it. Destroying these forests for low-value woodchips makes no sense. These forests are used for walking, mountain biking, bird watching and a host of other recreational purposes. They are worth far more to our community standing than chopped down. It is time the Victorian government got out of the logging business and protected our remaining native to preserve their biodiverstiy, and for future generations to enjoy. WE ARE appalled that the Baillieu government is so negligent in caring for Victoria's endangered species. It seems to be unable to learn from mistakes of the past that have led to so many species becoming extinct. In Toolangi we are trying to preserve the last of the Leadbeater's possum habitat and other precious animals after the devastating Black Saturday fires. Logging in this area will push many animals to extinction. Our government has a responsibility to govern for all in this state, and I am sure most people would prefer to save our state's emblem. No amount of money earned from logging could make up for the loss of a species which once lost, is lost forever. The government plans to weaken the laws that prevent logging from areas with endangered wildlife. We hear about logging in Indonesia and Brazil laying waste to vast areas. The same thing is happening on our doorstep. We need to preserve our native forests, especially on the edge of Melbourne as they help attract the rain to our catchments and moderate the temperature. JOSH Gordon's article (''Threatened species yield ground to loggers'', 17/8) starts with the wrong focus. These changes sound like they would help better protect threatened species. A 2009 report by the Auditor-General on the Flora and Fauna Guarantee Act found the act was poorly implemented and in need of review. Recommendations to improve the legislation were made in 2002, but have not been implemented. Nothing has changed in two years it seems, with the article stating ''the department currently searches for threatened species only in areas earmarked for logging, leaving most of Victoria's old-growth forests unchecked''. This means there is more monitoring in timber production forests than national parks. We need to invest in the management of our expansive national parks and stop being fixated on the small amount of timber harvesting. This debate is being skewed by the radicals and we need better landscape management. I applaud the government for finishing a job the last government left for eight years. Tasmania's Premier has revealed the $276 million forest peace deal will not proceed if a commercial settlement with timber company Gunns over its contract rights can not be reached. Lara Giddings says her legal advice is Gunns has a legal right to settlement money despite the company voluntarily handing back its native forest contracts. The Premier says an agreement is needed to extinguish Gunns' right to renegotiate contracts and clear the way for the forest peace deal. "And that's the element that the government is very keen to resolve," she said. Commonwealth assistance to forest contractors will not flow until the matter is sorted. "That's the issue that is really at the heart of this," she said. Ms Giddings says she knows a decision to compensate will be unpopular but the Government is legally bound to do so. "I'm very aware that the broader community are feeling quite angry at the moment of the behaviour of Gunns in recent times and the impact that they have had on decisions like Triabunna and in fact many people have come up to me and said they don't want to see one single dollar go to Gunns as a result. "There is an absolute interest in this issue." The money will come from a $23 million federal funding pool. An independent probity auditor will be appointed by the end of the day to oversee the process and an agreement is expected in weeks. The Opposition's Jeremy Rockliff is not convinced. "This Government and this Premier have bowed to Greens pressure all the way through this whole forestry saga," he said. "It's another example of the Premier and this Government outsourcing their responsibility." The list of worrying conservation policies is too long. THE Liberal Party in Victoria has a proud history of protecting the state's environmental heritage. Sir Rupert Hamer's government of the 1970s, in particular, left a legacy of environmental concern and legislative reform that continues to enrich the state's famed liveability. The Hamerite Victorian Liberal tradition is founded on such things as the strengthening of environmental protection laws under the watch of an independent and well-resourced Environmental Protection Authority and, perhaps most valuably, the creation of so-called green wedges between Melbourne's transport corridors to act, in Sir Rupert's memorable phrase, as the ''lungs of the city''. It would therefore be surprising, and distressing, if the Liberal/National Coalition government of Ted Baillieu were to preside over a diminution of Victoria's natural assets. Yet, the early signs are not good. Over summer, the new government took the retrograde step of allowing cattle grazing to resume in the National Heritage-listed Alpine National Park, arguing that more scientific research was needed on the discredited claim that grazing significantly reduces fire risk in the high country. The National Parks Association aptly condemned the study as ''the terrestrial version of Japan's scientific whaling'', and the federal government appropriately intervened to protect the park. In the absence of evidence that grazing can be done without further degradation, we believe the state government should abandon its plans to return cattle to the park again next summer. Last month, The Saturday Age reported that Planning Minister Matthew Guy has written to councils asking for them to provide wish-lists of changes they would like to see in their green wedge areas. It is telling that developers have welcomed the move, but environmentalists are deeply concerned. Sir Rupert's widow, Lady Hamer, was moved to write a letter to the editor, warning that any encroachment into green spaces was irreversible and urging that today's legislators keep faith with her husband's vision. ''Speculators, of course, will disagree, but remaining faithful to the original intention of the green wedges would give us all a more disciplined, sustainable and welcoming city for future generations,'' she wrote. We urge Mr Baillieu and Mr Guy to resist any temptation to compromise the integrity of green wedges to satisfy developers' wishes. Yesterday, The Age revealed that Victoria's old-growth forests could be opened to more logging under a Baillieu government plan to dilute long-standing environmental laws designed to protect threatened species. The Department of Sustainability and Environment has quietly begun looking at the state's 23-year-old Flora and Fauna Guarantee Act with a view to ensuring logging proposals are less likely to be derailed by evidence of the existence of animals deemed to be endangered. Departmental sources say the government is concerned that environment groups are becoming increasingly skillful at capturing footage of endangered species to thwart logging operations. Victoria's interests are indeed ill served if spurious claims made by over-zealous environmentalists are allowed to prevent legitimate commercial activities. But bone fide evidence of threats to the habitats of endangered species must continue to be afforded due weight in decisions about the timber industry. Victorians are entitled to hear more from the government about its intentions for the Flora and Fauna Guarantee Act specifically, and its attitude to the protection of endangered species more generally. The pattern that is emerging on environmental policy calls into question the Baillieu government's commitment to conservation. Mr Baillieu is often cited as a progressive Liberal in the Hamer tradition. On the environment, as elsewhere, he needs to do more to earn the comparison. This morning, 25 activists are unfurling a giant banner in a 72ha clearfell logging coupe in Tasmania’s south to protest retailer Harvey Norman’s continued sale of wood products sourced from native forests. The banner, which states ‘No Harvey Norman No! Don’t buy forest destruction!’, is one of the largest banners ever unfurled in Australia, measuring 60 x 18 metres. ‘Harvey Norman continues to profit from the destruction of Australia’s spectacular native forests. Today, we are sending a very clear message from the decimated forest floor and unfurling this massive banner to show the Australian people where their furniture is coming from’ said Ula Majewski, spokesperson for The Last Stand. Recently, Harvey Norman has been the focus of numerous campaign activities by different groups around Australia. A viral video parodying a Harvey Norman ad, which was released by Markets for Change and GetUp!, has received 100,000+ hits on YouTube. Peaceful actions in Harvey Norman stores have been happening all across the country over the last few weeks, including Melbourne, Sydney, Nowra, Hobart and Launceston. ‘This charred scene of forest devastation here in Southern Tasmania stands as a stark symbol of the industrial scale logging operations that are ripping apart Australia’s native forests every single day. Harvey Norman needs to stand up, show some genuine environmental leadership and stop selling native forest products to the Australian people’ said Ms Majewski. The Last Stand will hold a press conference at 2pm at Parliament Lawns Hobart. High quality aerial and ground vision and stills will be available. AUSTRALIA may finally be in a position to have its cake and eat it too when it comes to logging and native forests, Australian National University professor of environmental sciences Brendan Mackey said yesterday. He was among the leading science minds who gathered in Canberra for Australia's Forests and Climate Forum. The event followed the publication of major findings about the value of forests as carbon sinks in the journal Science last month. Professor Mackey told the Sunday Canberra Times Australia's plantation resources had matured and should be able to replace native forests as the source of timber. "There has been very significant investment in plantations over the past few decades and that wood has started to come online which allows us to take pressure off native forests," he said. "We have enough coming from plantations to meet the needs of industry and we are in a position to re-evaluate what we do with our forests.?? The report in Science, which was co-written by CSIRO researcher Pep Canadell, stated that the world?s established forests removed 2.4 billion tonnes of carbon per year from the atmosphere. Dr Canadell said scientists had previously thought the figure was much lower. "We can make huge savings in climate change mitigation by leaving forests in the ground," he said. "These findings have shown us that forests are very large carbon sinks." The former chairman of Australian Ethical Investments, actuary Naomi Edwards, said logging plantation timber was far more profitable than cutting down native forests. "People tend to assume we trash our native forests because we make a lot of money out of it," she said. "But that's not the case. "The only state forestry corporation that makes money from logging is South Australia because they have no native forest logging. ANU economist Judith Ajani said it was up to government to ensure Australia stopped logging native forests and fully moved to plantation resources. "Australian forests should be retired from wood production because of the size of plantation resources and it's a wonderful opportunity to let them do what they do best, which is to store carbon," she said. "This is a serious government leadership issue and it's only government that can do this job." Australia could meet almost half of its 5 per cent greenhouse reduction target by ending logging of native forests, according to a new economic study. The report, by Australian National University climate law expert Andrew Macintosh, estimates ending logging would generate enough carbon credits to meet 45 per cent of Australia’s emissions reduction target. In order to meet the 5 per target, Australia will need to reduce its carbon emissions by 152 million tonnes by 2020. “It’s one of the fastest and cheapest ways for Australia to cut its emissions,” Mr Macintosh said. The ANU study is the first to calculate the potential carbon credits Australia could generate over the next eight years by reducing, or ending, native forest harvesting. It found keeping native forest harvesting at current levels would generate credits equivalent to 12million tonnes of carbon, or 14 per cent of Australia’s total abatement target. Reducing harvesting to 50 per cent below 2002-09 average levels would generate credits worth 19 million tonnes, or 22 per cent of the 5 per cent target. “These are substantial figures, but the critical policy question is whether this is the most cost-effective way for Australia to meet its mitigation target,” Mr Macintosh said. According to the study, native forests are “now responsible for only a minority of wood production”, with harvesting falling by 41 per cent from 11 million cubic metres a year to 6.5 million. The study comes as a $276 million Tasmania forestry deal signed by Prime Minister Julia Gillard and Tasmania’s Premier Lara Giddings continues to meet opposition from business, industry and environmental groups. The package offers $85 million to support forestry workers and their families affected by a plan to protect 430,000ha of high conservation forests as reserves or national parks. The Federal Government will provide $43 million to manage these areas, and $120 million will be allocated to establish new industries, such as forestry tourism, in affected towns. Tasmanian Chamber of Commerce and Industry chief executive Robert Wallace has dismissed the deal as pandering to Greens voters “in the trendy cafes of Melbourne and Sydney”. “If we had to live on forest tourism income alone, we would be poorer than Papua New Guineans. Tasmania does have a great future in tourism, but not at the expense of other industries and opportunities,” he said. Tasmania’s acting Premier Bryan Green said yesterday the state Government would not be swayed by “vested political interests” trying to undermine the agreement. Mr Green said the agreement would allow those workers affected by the timber market downturn and a recent decision by Tasmanian timber company Gunns to quit native forest harvesting “to leave the industry with dignity”. He said the Government would restructure the state’s forestry industry and use federal funds to benefit regional communities. “There are forest workers counting on the Government to deliver this agreement and we will not let them down,” he said. A PROMINENT Healesville environmentalist has vowed not to let criminal charges deter him from fighting logging in Toolangi. Steve Meacher, who ran as the Greens’ candidate in McEwen at the 2010 federal election, was one of three protesters arrested early last week for entering a logging exclusion zone at Sylvia Creek. He told the Leader he plans on contesting the charge of entering a designated public safety zone. “We believe it’s the logging that is illegal,” Mr Meacher said. “This is not going to deter me in the least. Only stopping logging will deter me. A series of public meetings has been held, attracting an estimated 100 people, with another meeting planned for Thursday, August 11, at the CJ Dennis Hall. The Department of Sustainability and Environment confirmed two people were charged on Monday, August 1, as 13 were escorted from the public safety zone. Three protesters were arrested. A tree sitter was removed later that day from a 40m perch. However, days later a second person climbed a tree to again impede logging efforts. VicForests spokesman David Walsh said protesters who illegally entered the public safety zone had endangered themselves as well as contract staff working in the area. “It is important to note that these are legal harvesting operations which comply with the detailed legislative framework governing native timber harvesting in Victoria,” he said. Ironically, former Liberal candidate for the seat of McEwen, police officer Cameron Caine, was at the scene as Mr Meacher was arrested and charged last week. Treasury officials will face a South Australian parliamentary inquiry today on the planned forward sale of forest timber in the south-east. There was a hearing at Mount Gambier recently at which former forests minister Rory McEwen said the decision to sell more than a century's worth of harvesting rights had been made by Treasury zealots. Inquiry chairman, MP Rob Brokenshire, said Treasury's motivations would be forensically examined at the Adelaide hearing. "Have they factored in the fact that Forestry SA really still is the foundation of all forestry activities, particularly in the south-east?" he asked. "There are questions around how they're going to manage the rest of the forests in the mid-north, in the Adelaide Hills etcetera because they were really underpinned again by the strength of forestry in Mount Gambier. "The Government have said that they're going ahead no matter what, but of course I think that would be a very dangerous move if the evidence of the committee does come out that shows overwhelmingly that it's in the best interests of the state not to sell." The Greens say the ACCC needs to investigate whether paper products being sold in Australian stores are the result of logging in Indonesian forests. The ABC's Foreign Correspondent program last night aired claims Sumatran rainforests are being cleared by Asia Pacific Resources, which runs the world's largest paper mill. Greens Leader Bob Brown says Australian consumers need to know if they are being hoodwinked. "I'll be referring the program to the ACCC to investigate the claims that there is labelling on this paper from rainforest destruction in Indonesia claiming it to be coming from plantations," he said. Senator Brown says the Federal Government should ask the Indonesian government for an explanation of the widespread logging. He says the logging was supposed to have been stopped. "The Howard Government, with high publicity, gave $200 million of taxpayers' money to Indonesia to stop this logging of the rainforests," he said. "But in fact what we saw on Foreign Correspondent is a broad-scale destruction of some of the most important wildlife habitat on the face of the planet." One respected authority who’s seen it first-hand doesn’t mince his words. The rate and scale of forest clearing in Sumatra by big paper producers approaches ecological Armageddon. Riau province in Sumatra is home to the world’s biggest paper plant. It’s owned and run by Asia Pacific Resources International Ltd, better known by the more disarming acronym APRIL. The company has embarked on a massive land clearing project, removing natural stands of timber and replanting fast-growing acacia trees and when it’s done it says the plantation timber alone will feed the plant. APRIL describes this program as sustainable and certainly preferable to the ad hoc land clearing and burning which blights so much of the Indonesia archipelago. As the carbon debate rages in Australia, Indonesia correspondent Matt Brown ventures into the rapidly diminishing Sumatran jungle, destruction adding dramatically to Indonesia’s greenhouse gas outputs and catapulting the nation high up the list of the world’s worst emitters. Foreign Correspondent focuses on the activities of APRIL in Riau province where its gargantuan development has led to a bustling town of 250,000 people, many working for and benefitting from APRIL’s plantation and factory. It produces office paper sold by some of Australia’s largest retailers. But our team explores beyond what APRIL proffers as a model development, to investigate claims of corruption in a nearby area where logging companies appear to have bribed their way into operation. An APRIL subsidiary has been implicated in a paper trail leading to a powerful local political figure now in jail for accepting bribes in return for production permits. And we investigate the implications of major plantation and milling development on Sumatra’s sensitive and carbon-loaded peat beds. As the bulldozers move through the peat beds, peat dries in the sun and enormous clouds of greenhouse gas are expelled into the atmosphere. Environmentalists and many villagers worry about the dramatic changes reshaping the land and also about the plight of residents who’ve been there a lot longer than most - like the Sumatran tiger. As part of our investigation we sought input from two major companies who sell and distribute APRIL paper in Australia. We asked Officeworks and Fuji Xerox to answer a number of questions. Officeworks hasn’t responded, but here’s what Fuji Xerox had to say. Environmental protesters have partially blocked government offices in north-west Sydney over the logging of native forests on the NSW south coast. Several members of South East Forest Rescue (SEFR) scaled 25-metre trees in the Cumberland State Forest, near Pennant Hills, this morning and unfurled a banner reading "carbon criminals". Other members of the group blocked vehicular access to nearby NSW Department of Primary Industries (DPI) offices by tying cables around gates, SEFR spokeswoman Lisa Stone said. A DPI spokesman told AAP: "Protesters have blocked most vehicle access to Cumberland State Forest. "Staff are at work and it is business as normal." Ms Stone said protesters were equipped with supplies and might remain in the trees for several days. SEFR is demanding meetings with NSW Primary Industries Minister Katrina Hodgkinson and federal Environment Minister Tony Burke to discuss alleged native logging licence breaches. "Millions of tonnes of greenhouse gas emissions are released into the atmosphere from the logging on the south coast," Ms Stone said. SEFR is also concerned about the effect that logging may have on protected species and believe the practice is unsustainable. Police were called to the entrance of the DPI building in Oratava Avenue just before 7am and remain at the scene. A Victorian population of koalas is being threatened by logging, a Senate inquiry has heard. Friends of the Earth is calling for the Strzelecki koala to be recognised as a threatened species because its natural food source is being eroded. Land use researcher Anthony Amis from Friends of the Earth says mountain ash trees felled in the Strzelecki Ranges in South Gippsland are being replaced by shining gums in plantation areas after harvest. "Mountain ash is a koala feed source, shining gum is not," Mr Amis told the hearing today. A significant number of koalas in the region also died in the Black Saturday bushfires and many of the animals continued to suffer stress-related conditions from the fires, the inquiry heard. "It is probably beyond the ability of our environment groups to pull together the best science in Australia to save this animal," Friends of the Earth said in its submission to the inquiry. "It would probably require several hundred thousand dollars and a dedicated team to properly understand what is happening on the ground with this animal." The Senate Standing Committees on Environment and Communications is examining the status, health and sustainability of Australia's koala population. Asked by Senator Doug Cameron whether forestry and koalas could co-exist, Mr Amis said: "In a dream they probably could. "I think if you had minimal logging, say took out a couple of trees per hectare, potentially it could work. "But the demands of industry are to knock out entire catchment areas." Hancock Victorian Plantations chief executive Linda Sewell said the company, which operates about 45,000 hectares of plantation forest in the Strzelecki Ranges, provides corridors for koala movement to native areas. Ms Sewell said an operating standard requires workers to conduct a "visual" assessment of any koalas before logging periods, and if koalas are found during harvesting, operations are temporarily suspended while koalas move through the logging area. The committee is due to report to the findings of the inquiry by August 24.